I write because my son learned to speak his first words looking at images of animals, and foremost among them, the African elephant, like a stalwart throne in the imagination of childhood. I write because a prayer has sounded for the life force of the planet. I write because my son learned to walk in the cradle of humankind in Kenya amazed by the elephantine mind. I write because childhood and the human soul is literally on the line. In this second phase of the elephant genocide, after the loss of 500,000 elephants in the 1980’s, about 100,000 from 2010 to 2012 were slain in Africa where the GDP of its average citizens is 3% of what an American earns. The dustbowl of poverty, which incites poaching in Africa, is off the charts. My words may fall on deaf ears but I imagine that the newly wealthy in China have children and that these children will want to have something to offer their children in a generation’s time. I have seen my son amazed by the largest mammal ever to walk the earth in this time ambling by him at ten feet tall. Africans do not use or consume ivory except in very rare rites and rituals. The market fueled by Chinese demand and by Chinese nationals in Africa is in the process of obliterating herds of elephants so they can adorn their mantelpieces, to proudly show off to their neighbors that they have arrived. But in the process they are wreaking havoc on many countries like Kenya and the Congo where the forest elephant has been decimated and who depend on either tourism or foreign investment for their future. In Africa there is a saying in Swahili “Ukiue Ndofu Utalaaniwa,” if you kill an elephant you will be cursed. In the drug trade, which the United States seems so bent on eradicating, tens of millions of dollars are spent to stop the dealers. The drug trade is not dependent on the fly infested carcasses of a newly gunned down elephant. Poppies can bloom once again. Coca leaves can photosynthesize once again. But annihilate the mother elephants and the tusked fathers of two-week old orphaned elephants, and it will take generations for elephants to rebuild their population. Terrified infant elephants roam without their parents. Millennia of genetic memory and culture have been shattered out of existence. Something we presumed unbreakable in the great chain of nature evolving has been shattered by human greed and avarice. The elephant have helped our ancestors find water in times of drought for thousands of millennia. In the process our place on earth is being uprooted. I believe if humanity cannot stop the ivory trade and do more than make public relation stunts that say that ivory will be banned for a year, when it should be outlawed, irrevocably and finally, forever, we could see elephants fading from many parts of Africa. Even the children of poachers and kingpins of the ivory trade will have lost because for their children there will be nothing to hear rustling in the bush or in the outback of their imagination than the screams of their own loss. Other species will evaporate into thin air. We will have proven to children worldwide that adults care for nothing more than man made trinkets and the lucre of germ infested dollar bills. And they may eventually come to curse even their parents. It will send a cascade of irretrievable loss throughout the firmament of the biosphere and the life force of this irreplaceable planet will have been given a slow death sentence. The curse will be complete and money will mean very, very little indeed. If we cannot salvage the elephant and its giant pachyderm neighbor, the rhino, what on earth can we hold onto? Can the industrialized countries, including China, finally come to terms with the future of a species, the future of an entire continent and the lynch pin in whether global conservation efforts can work in tandem with governments around the world to stop this ongoing genocide? Can we as citizens of the 21st century save anything at all but the juggernaut of a cannibalistic economic system, which is costing us the life line to life itself? Anti poaching efforts and the money spent by financially poor countries cannot hope to match the money poured into the illegal wildlife trade. But the US, if it were serious could outspend and out gun anyone, even the Oriental market. Capable businessmen and investors in the future can give freely and generously to anti poaching campaigns. Air Shepard, supported by the Charles A. and Anne Morrow Lindbergh Foundation is key to stopping many poachers in the field. They need the support of the world community. The question is: does the US really want to? Business as usual is not working. The ivory crush that pulverized six tons of ivory into dust in Denver in November 2013 was the first to demonstrate that the US was willing to make a stand against the ivory trade and ivory syndicates. Many other countries followed suit but where will be the reminder that great herds once flourished? Our son recommended that monuments to dead elephants should have been erected in their memory on each continent. The DNA of gunned down elephants was wafted into the atmosphere and spread around the world. We now harbor the genetic material of the elephant in our veins. We walked out of Africa alongside the elephant. We have heard wonderful accounts from the Ndorobo and other tribes in East Africa that elephants have helped our ancestors find water in times of drought for thousands of millennia. Some native people of Kenya say the elephant is not just another animal but the mind of nature itself. Like the mind of the great apes and the cetaceans they stare back at us with unmistakable, irreducible, unequivocal mindfulness. We are at a crossroads morally and spiritually on planet earth. Patriarch Bartholemew urges the world to meet Creation head on and listen to the spiritual values that are indispensable in addressing the environment. Elie Wiesel was kind enough to share his concern years ago. He said to save the elephant is an “urgent moral imperative.” The United Nations needs to have an emergency meeting over this species to follow the March for Elephants, which was the first march for another species in the history of the world in October 2013. Corruption needs to be addressed at all levels of government. A year ago, was the hundredth anniversary of the extinction of the passenger pigeon. Who could have conceived at the beginning of the twentieth century that this singular bird whose numbers blotted out the sun, and who numbered in the tens of millions would vanish in less than a generation. Romain Gary who knew firsthand the horrors of WWII wrote. “Where there are elephants there is freedom.” A world without elephants, even a world with severely reduced populations only incites more violence and convulsions across the entire body of the African and Asian continent. We are at a crossroads morally and spiritually on planet earth. Since born in 1958, Christian had never seen an elephant.” It was so astonishing! The Master General said, “This is a sign of peace.” So all 1200 men all lay down their arms right there! “Seeing an elephant was a sign of peace. The elephant brought a cease-fire and total peace. Some people did not believe the elephant was peaceful. Some of our men ran. One of the men who left us went to another front in another part of the country to fight and in the process got killed! The elephant is so connected to us. When I went to Tanzania many elephants came close to our vehicle. I could see elephants in a social way, which was so profound for me. I believe the elephant saw the tears of our women in the war and prayed for peace to come. Both sides did see the elephant. We lay down our arms. We need not disturb the peace of the elephant. We need to protect the land. We need to have a profound relationship with the elephant. Let’s see how we are connected. The sense I got was I felt the elephant did care for our suffering, that women and children had been killed in war. The elephant said OK its over and from that time on, not a single bullet has been fired at all in Liberia! Seeing an elephant made me change and made me peaceful and changed my life. The elephant was a peace ambassador. There is time. There is hope still. Air Shepherds funded by the Charles Lindbergh Foundation is using drones to target rhino and elephant poachers. They need the support of the world community. But something has to change in the human heart as well. The baby elephant that came to our car in Samburu to kiss the elephant insignia on our car, is the greatest confirmation of life and why compassion is needed now as never before. The prerequisite to compassion is to transform one’s inner landscape. There is no room for despair. We need a re-wilding within ourselves. And that includes heads of state presidents everywhere and politicians worldwide. If the great tusker who was out of control, in musth, could calm down and bow in front of the historical Buddha, surely humanity can find a way to honor this imponderable monarch. Before it is too late. Recently I heard a story that underscores the importance of the other and the great scourge of this time, the loss of biodiversity worldwide. A pregnant woman accidentally fell off a boat off the South Carolina shore. A school of dolphins that could hear her unborn child’s heartbeat rushed to her and stayed with her, protecting her until she was rescued! And then there is a remarkable story we uncovered of a Kikuyu woman near Kilimanjaro who gave birth in the wild with the help of a bull elephant who built an acacia thorn fence around her to protect her from hyenas lions and leopards. It is no coincidence that since the Great War, the violence we have wreaked on the biosphere has increased alarmingly. The TEEB the Economics of Ecosystems and Biodiversity works to underscore the economic benefits of biodiversity and to humanity. Since 1970 half of all the world’s animals have been lost! 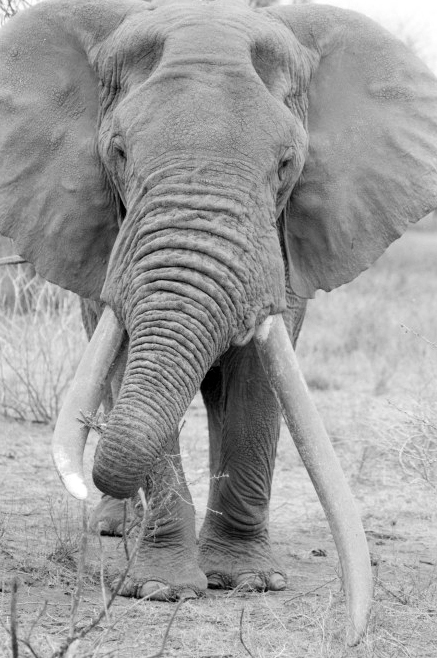 A Samburu elder once told us, if we lose the elephant, “We will lose our minds. The only thing left will be to kill ourselves.” As the prophetic Romain Gary wrote in his, The Roots of Heaven, in 1956, “On an entirely manmade world, there can be room for man either.” Let us not tempt the fates. We will self cannibalize without the supreme terrestrial ballast of the elephant. A world without elephants, even a world with severely reduced populations only incites more violence and convulsions across the entire body of the African and Asian continent. Let those with the resources and the financial means start a revolution of global compassion and activism in the human heart. It is not enough to spend hundreds of millions to fight Ebola, money that is spent out of fear for the human species, when environmental degradation and forest desecration is the source of rampant disease. Hundreds of millions of dollars need to be spent to help African countries enforce anti poaching measures and billions need to be spent to fight poverty and overpopulation and to ensure that her forests remain. The illegal wildlife traffickers of ivory and rhino horn and tiger skin and shark fin trade may realize that their business is another kind of slavery. Increasingly the penalties are rising. But this is a war that must be won on all fronts. And it is a war that is as large, though not as obvious as WWII. At some point the illegal trafficking will end. But will the life force of the earth still have a pulse? Will there still be the face of the other to amaze those of us who still respect life? The elephant is one of the pillars of existence and the curse that those native elders say we inherit if we kill an elephant has entered the karma of the world. We need to reverse course as if our lives or at the very least our soul depended on it, which it does. What will the children of tomorrow inherit? The answer to that question will determine the outcome of the 21st century. Cyril Christo is an award-winning photographer and filmmaker. He and his wife, Marie Wilkinson, have travelled extensively around the world. They have published several photography books exploring ecological and man-made challenges and endangered bioregions and species. The couple is currently working on a documentary film, “Walking Thunder: The Last Stand of the African Elephant,” which weaves a family’s personal journey in East Africa with indigenous people’s stories.